Spot on! The band were on top form. Rick Wakeman dazzling as ever, his keyboard skills never fail to amaze me. Steve Howe was incredible, didn't hit a bad note all night. Jon's vocals were nigh on perfect. Chris put in an incredible stage performance and Alan rocked, as usual. But Rick stole the show for me. His Keyboard solo in Starship trooper was breathtaking and THOSE piano licks in Roundabout were like nothing on this planet. Highlights-Yours is no disgrace, South side of the sky, Wonderous stories and Ritual. Am I the only person who spent the whole of the show thinking that a giant inflatable flying cow was about to crash land on the stage behind Steve? Was it Roger Dean who designed the set or Gary Larsson? What a great gig this was, great sound, great musicanship, great lights, shame about those bouncy castles on stage. I loved the version of Sweet Dreams, fantastic, South Side Of The Sky was outstanding, in fact, the whole gig was the finest I have seen in a long time. Sensational concert. We missed the first two tracks due to being in the pub. Didn't expect Yes to be on stage so early. Gutted ! What a great show. All the band were absolutely fantastic. Best songs for me were, going for the one, and you and I, Starship trooper, and wonderous stories. Can't wait to see em again. 4 rows from the front, middle section, couldn't ask for better seats. The band weren't quite as loud as in Brum the night before, but it's great to actually hear them properly again, unlike last year when I was permanently begging the buggers to just turn it up. 1. Rick with a Manchester City scarf draped round his rig, and wearing Man City strip throughout the gig. I'm sure he used to support Brentford mind. What happened there Rick? 2. Chris flirting outrageously with 3 rather nubile looking chicks about 3 rows from the front. I reckon they had to be his daughters, which is worring in itself I guess, if only because the alternative is that they were 3 rather fit groupies who for reasons best known to themselves had shelled out a fair wedge for the privilege of swapping bodily fluids with Chris. I mean, really? I know he's a musical god but have you seen the state of the big feller these days, not that his leggings left much to the imagination. The purchase of a good firm pair of dung-hampers wouldn't come amiss. 3. Rick and Steve pretending to read the Number 1 Soaraway Sun in mock boredom at Chris's intro to Roundabout. Wouldn't something by Paramhansa Yogananda (is that how you spell it?) have been more apt? 4. Pretty good attendance - the 2nd tier seats were curtained off, but even allowing for that I would think there was a good 12000 in the hall. I saw Peter Gabriel 2 weeks before in Sheffield and he certainly pulled in less punters than the boys. 5. Musical highlights - Going For The One-how has this been locked away for so long? Mind Drive- don't agree with the bloke who said it was shite, though the middle section which was edited out is a highlight of it for me. Steve also should have stayed more faithful to the original solo in the second part as it's one of the best things he's done in the past ten years. Turn Of The Century - back in the original key throughout, Jon just gets better with age. Not sure they got the middle section right though. YIND and AYAI - old faves but essentials for any setlist. Will this be the last tour? I hope not, but if it is they'll have gone out on the top of their game, and perhaps there's something to be said for that. Ten feet from the stage, brilliant sound - great choice of tunes. Loved every minute, Ritual was spectacular and I loved the Rick/Steve duel in South Side of the Sky. All the crowd pleasers and more. Hardly surprising that they weren't singing out of tune - they use pitch correctors! That doesn't mean that they weren't singing well. We thought that Jon hasn't ever sang as well in his whole career - not bad for a man of 60! Last year at Liverpool was a storming gig but this was Yes back where both they and their music belong - on the big stage arena stage. Going For The One was a superb choice of opener and although the atmosphere went a little flat during All Good People the band soon picked it up again with a storming South Side (featuring a wonderful guitar/keys duel between Steve and Rick) and an absolutley beautiful version of Turn Of The Century. Jon and Chris's vocals were superb throughout the show - I don't think there was a note out of place all night. Obvious highlights were Yours Is No Disgrace, And You And I and a stunning rendition of Ritual. It was great to finally see the piece performed live by the five who wrote it - it's been a long wait!!! Just to add my twopenneth. Thought the whole show was excellent. We were on the lower tier about 20 yards or so from the stage on the Steve Howe side. I thought they were in top gear from Going For The One. Just about every song had a standing ovation; the crowd was so appreciative throughout. The end of the first set, with YIND was greated wildly, as was AY&I (everyone was on their feet), as for Ritual and Starship Trooper - just fantastic - I thought the place went wild. ST was absolutely stunning. Chris Squire was definitely up for it last night, it was like the Chris Squire show for the second half; I'm not complaining, I have never seen anyone play the bass like this guy. Just fantatstic. I had a friend with me who hadn't seen them for 30+ years; he thought they were top draw. An excellent performance, as good as Liverpool last year. Great show an' that! Just gets better every time! Did anyone else notice that about 5 songs into the gig, the left speaker stack was suddenly switched on (forget which song)? Also got the impression that the robo-testicles were supposed to come in earlier - don't know if they have been or not at previous shows - as Alan White seemed to stand up to point at them (or it could have been a pose), and Chris Squire gave 'em a whack just before banging his Tympani - seemed to work! Fair comment Joe - next time perhaps we share a taxi! Point taken John & John, just to clarify, I live in the sticks in Hebden Bridge and so the 10.47 from Victoria was the last train we could actually get (although annoyingly all through the week the last train is around 11.15!) It's always difficult to gauge the tone of the written word and I meant my comments in a light hearted way, I've been a Yes fan since '76 so can for give them pretty much anything (apart from 'Open your eyes'...don't even get me started on that !!! Glad you enjoyed the show...as did I ! Joe - it's you who needs to get your timing better organised - I am from Leeds, saw the whole show, went for a celebratory cup of tea and burger afterwards (rock and roll!) and still arrived in time at one of the three stations you had a choice from in Manchester to get a train back to Leeds (I left just before midnight from Piccadilly and they run through the night anyway). The audience was called to the auditorium at 19:25, and the Firebird Suite started at 19:40-ish. Have to agree that Mind Drive was a disappointment, though it sounded better on the San Diego audience recording I have. Have to disagree with the drum/bass section in Ritual. I enjoyed it, as I would prefer more improvisation in their performances, but I guess it's getting a little too late for all that. I thought the mix and performance started a little poorly, but improved afrer Sweet Dreams. Highlights were the acoustic set, And You And I, and Ritual. The acoustic set proves that a good song can be played any way. 1 - Play it earlier in the set (only drawback being it's a great song to end on! 2- Drop 'Mind Drive', 'cos let's face it, it's crap ! (and why it requires a conclusion God only knows - I thought it would never end and you could have played 'Close to the edge' instead, I mean c'mon, you're celebrating 35 years...'Mind Drive' !!!! 3- Cut the drum and bass solo's in 'Ritual, they really weren't that interesting. Thanks for a great night boys ! 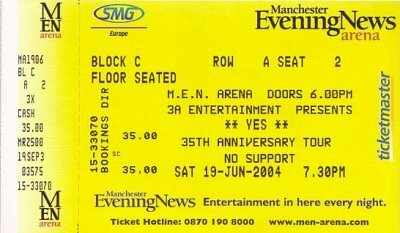 I have never seen Yes before as I am only 15 but I can't wait. Looking forward to wonderous stories and And you and I.
Wooh! Thank you so much. Thank you. Thank you so much. Thank you. It�s great to be with you tonight. Thanks for coming out. We really appreciate it so much. Thank you so much. Thank you. You create everything. You create everything, every day. You create the world. You create your world, every day. It�s amazing. And the mind and the drive inside to make it all work, to put it all together. We call it the �Mind Drive�, the �Mind Drive�. Thank you. Thank you so much. Thanks for listening. Thank you. Of course, that�s �Mind Drive� from 1996, 7? 8? He�s got a copy of it, so. We sold one here, not bad going. We're going to go and have a cup of tea after the next song, and a chocolate biscuit. It�s true. And more drugs, actually they�re vitamins, actually. More vitamins, sorry! Ha! Wooh! Did I say that? Did I say drugs? Wow! After the count of five. Thank you so much. Thank you. Us guys, us guys up here on stage have traveled quite a lot over the years and ahh, one of the times we were in Switzerland, would you believe for about six months, spending a hell of a lot of money making a record, and eating a lot of cheese and we didn�t learn to ski, for some reason. Too busy, too busy making music, it was. But we did write this song, one lovely Tuesday afternoon, about three thirty. Thank you so much. Thank you. Thank you. Thank you so much. It�s ahh, another special night tonight, because ahh, Alan White is wearing his kilt, with his sporran! His sporran. There you go. [??]. Ha! But ahh, he didn�t have his sporran until yesterday, now he feels complete! Rick? Okay, Steve? Ahh, we�re going to do a song which we ahh, recorded a couple of years ago, and in, in doing it during the tour, you realize that the lyrics are really about how time has saved us to be together yet again, here in 2004. So, in a way, it�s such an amazing feeling to get together again, and ahh, time has saved us, time has moved and ahh, here we are. And ahh, this is a song with a wonderful, sorry, a wonderful introduction from Alan, with a paradiddle in the middle of it. Here we go. Thank you so much. Thanks. Ahh, Chris is going to have a quick chat here with you. He�s been practicing his Indian Chinese, but now, he�s going to do it in English tonight, so. I�ve been practicing my Manchurian! Ha, it didn�t work though. Um, we ahh, last year we made an album called �The Ultimate Yes� collection, which was a collection of our better-known songs, I guess, through the years. And ahh, it came out in England and a lot of you bought it, thank you very much. And then ahh, ha! I don�t, (to Rick) do you want me to get you a curry? So um, then it came out in America and they wanted to put a bonus added value disc in with it and they asked us to do some acoustic songs. And so ahh, we decided on the songs and one of them was �Roundabout�. And um, Alan and I were in the hotel in Tokyo discussing it, ahh, how we were going to put the thing together and ahh, Alan I think suggested well why don�t we try a swing kind of a Chicago blues type feel and I said that sounds like a good idea. So we got to the studio, in L.A. and we said to Rick �give us a nice Chicago blues version of �Roundabout� on the Joanna�. And he went (Rick plays). And we said, that�s it! We�ll do it like that. That�s a brilliant idea. Fantastic! Thank you. Wooh! Thank you so much. And now other, another famous paradiddle drum intro from Alan White on the kilt, on the drums. Try it again, in the key of. Thank you so much. Wooh! Thank you so much. Thank you. Thanks. We�re going to break things down and leave you in the capable hands and guitar styles of Mr. Steve Howe! Thank you very, very much. It�s great to be back in Manchester. Thank you. That was called 'Second Initial'. My pleasure. Thank you. [??]. Thank you again. Thank you for keeping up with me there. Boogie-ing a bit. One of the great things about um, coming round, as we do over the years, there�s one song that we�ve been playing a long time, and ahh, no matter where, no matter how, no matter when we play this song, it�s always a treat for us to be able to play it and to have an audience to even to listen to us. So, thank you and ahh, cha! Wooh! Thank you so much. Thank you so much. It�s so amazing, the power, the power of you listening. It�s so amazing. Like a dream, a ritual! When we get together, like a ritual of life, a ritual of music, a ritual of love. Love is everything! Love is everything! Love is everything! Everything! Love. It�s �Ritual�. Thank you so much. I want to thank you all for coming out tonight. I want to thank you all for supporting the band and making tonight such a special evening for us. We hope you had a good time. Here we go.